Style Spots on a Wednesday? Bold...I know. :) But I only went on one thrifting adventure this weekend that turned up one thing, so I thought it could wait until I was home and had my camera available. Sunday afternoon, my sis-in-law Molly and I went to the St. Vincent de Paul on South Congress in Austin, followed by a huge Salvation Army about 10 minutes from there. The former seemed like a great place to go for clothing, but all the really cute stuff was put in the boutique area at the front, and the dresses were $10 up to $25, which I know isn't horrendous, but definitely not what I'm used to. 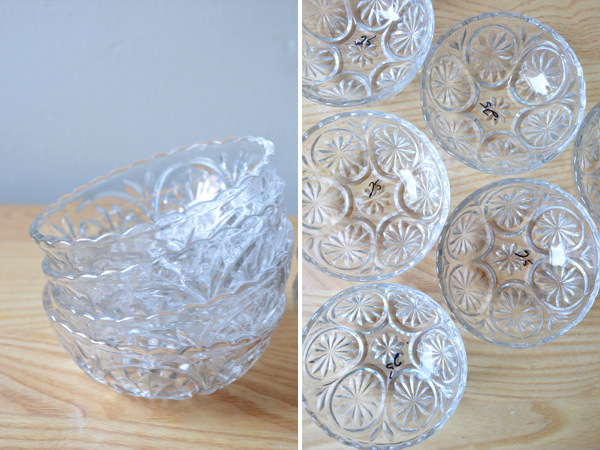 I tried on a couple things and ended up putting them back since I'm trying to be more selective on my thrifting adventures, but I did pick up a set of six cut glass berry bowls in the housewares section for $1.50. As much as I love the Butterfly Gold pattern I've collected for our everyday dishes, I think I'm slowly going to change them out for a more eclectic collection, and these bowls fit right into that plan. The Salvation Army was definitely impressive as far as size, and the furniture section looked like something out of a showroom, but overall, I was really surprised at the prices (I found a dress that was NWT for $35! ), and just ended up buying some shirts and a pair of swim trunks for the hubs that were 50% off (only the trunks fit though...oh well!) and a yellow/orange moo-moo-like dress for me to lounge around in at home (definitely nothing worth taking a photo over). Ooooooh! Those are exactly like my grandma's bowls that my cousin's wife snatched out from under my nose when grandma moved into a nursing home. Down on So-Co, the prices at thrift stores tend to be a little higher. You're better off hitting the bigger stores in North or South Austin. Thrift Town, Savers and the Goodwill Blue Hanger are some of my favorites!